benthic algae, Hillebrand (2005) found that a decrease in grazers or an increase in light each had positive effects on algal biomass, and the enhanced effect of light was generally observed in the absence of grazers. 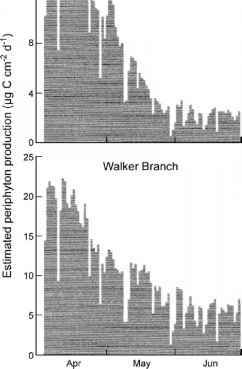 Columbia differed with canopy cover (Kelly et al. 2003). The reach with full canopy showed no response to UV reduction and had higher invertebrate biomass and lower algal biomass compared to other reaches. At sites with less canopy cover, algal biomass declined in response to higher UV-A, whereas invertebrate biomass declined in response to both UV-A and UV-B. This negative effect of UV radiation on invertebrate biomass, including grazers, likely resulted in higher algal biomass in the reduced canopy sites. Experiments conducted to study the effects of UV radiation on diatoms found that responses were highly species-specific (Hodoki and Ohbayashi 2005). Greater growth inhibition in response to UV radiation was observed in species adapted to low light versus high light-adapted species. In addition, higher tolerance has been recorded in algae with dense growth forms. Dissolved inorganic P, N as nitrate and ammonia, and silica are generally considered the most critical nutrients for algal production, although other chemical constituents also can limit growth under some circumstances. Limitation of benthic algae by nutrients is primarily by N or P. The supply of silica also might be expected to become limiting, because the frustules of diatoms are composed of silicious material and diatoms are a major component of the periphy-ton of cool, shaded streams. Although the dynamics of lake diatom populations have been shown to depend upon silica concentrations (Wetzel 2001), silica in rivers rarely is in short supply (Chapter 4) and consequently it may seldom limit diatom growth. However, few studies have assessed its importance as a limiting factor in running waters (Borchardt 1996). Nutrient enrichment studies provide ample evidence that nutrient supply can indeed limit benthic algal growth in nature. Studies of periph-yton dynamics in small streams of the west coast of Vancouver Island, a temperate rain forest setting, have demonstrated strong P limitation (Stockner and Shortreed 1978). Nitrate enrichment produced little response, but periphyton accumulated rapidly when dissolved inorganic P was added, exhibiting roughly a fivefold increase in response to P enrichment alone, and an even greater increase when both nutrients were added (Figure 6.6). Filamentous green algae responded dramatically to P enrichment. Cyano-bacteria, which can fix atmospheric N and thus should have a competitive advantage under low N conditions, did not flourish under the nitrate treatment, despite the fact that N fell to low levels. However, the frequency of the diatom Achnanthes minutissima decreased in the nitrate-only treatment while it increased in the other troughs, and this may be an indication that changes in the N/P ratio can adversely affect particular taxa. Subsequently, this catchment was logged, allowing a direct test of the effect of increased light on periphyton biomass. Essentially no change occurred, and the case seems clear that low P concentration is the primary limiting factor in this environment. Sixteen years of summer P additions to the Kuparuk River on the North Slope of Alaska (Slavik et al. 2004) resulted in a change in community composition in which bryophytes replaced epilithic diatoms as the dominant primary producers. Positive responses to fertilization were observed at all trophic levels including increases in epilithic algal stocks, some insect densities, and fish growth rates. However, this open tundra stream receives ample light. 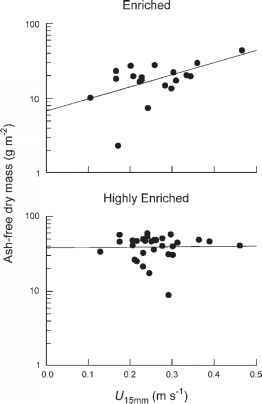 A 2-year nutrient enrichment with both N and P in a forested stream in Georgia had little detectable effect on benthic algal composition or periphy-ton biomass, again showing that heavy shade can suppress response to nutrients (Greenwood and Rosemond 2005). In a forested Mediterranean stream with modest light levels, nutrient addition increased chlorophyll concentration and algal density, but no changes in community composition were observed (Sabater et al. 2005). Additional evidence of nutrient limitation of benthic algae has been obtained through the use of nutrient-diffusing substrates. In this approach, clay pots are filled with an agar solution containing the desired mix of nutrients and capped with a plastic petri dish (Fairchild and Lowe 1984). Nutrients leach through the pot, although rates can be somewhat variable depending on thickness and consistency of the clay walls. Pringle and Bowers (1984) used sterilized sand from the streambed consolidated with agar and nutrients in petri dishes, thus achieving very consistent release rates. Studies in Carp Creek, a small, nutrient-poor stream in northern Michigan, demonstrated that P was limiting to periphyton, and additions into the water column and from diffusing substrates each could enhance periph-yton abundance (Pringle and Bowers 1984). are abundant in this system, and simultaneous manipulation of both fish and nutrients revealed a stronger effect of consumers than of nutrients on benthic algae. Interestingly, the N addition produced a greater response where fish were present, suggesting that fish had the dual effect of consuming algae and regenerating nutrients. Nitrogen limitation was demonstrated in Sycamore Creek, a desert stream in Arizona, by adding nitrate-N to agar within clay saucers placed on the streambed (Peterson and Grimm 1992). Unen-riched substrates were dominated by an N-fixing diatom, whereas enriched substrates had a higher diversity of non-N-fixing diatoms and a delayed transition to an N-fixing cyanobacterium that typically became abundant later in algal succession. In a subtropical river in Queensland, Australia, chlorophyll increased on N-enriched substrates in comparison with the controls and P-enriched treatments (Figure 6.5). Whether N or P is limiting to algal cells often is assessed from their ratio in the environment. Based on the finding that for marine phytoplank-ton, the ratio of C/N/P in algal cells is remarkably constant at 106:16:1 (Redfield 1958), it is generally held that P is limiting when environmental concentrations of N/P exceed 16:1, and N is limiting when the ratio is <16:1. This should be viewed with some caution, however, as recent evidence suggests that the Redfield ratio is an average of ratios for phytoplankton species in the ocean, and N/P ratios for individual species can vary widely (Klausmeier et al. 2004). For several reasons the use of nutrient ratios as an indicator of N or P limitation should be viewed with caution (Dodds 2003). Internal cell concentrations should be considered when assessing nutrient limitation because cell nutrient content may differ from ambient levels due to P storage within cells and differences among nutrients in uptake rates (Borchardt 1996, Dodds and Welch 2000). In addition, streamwater concentrations may not reflect rate of supply, and the substitution of nitrate and phosphate for total N and total P may underestimate what is actually available. Nonetheless, interpreted cautiously, N/P ratios provide helpful insight into which nutrient is more likely to be limiting. Most streams of the eastern United States have quite high (~70:1) ratios of N/P, suggesting that P limitation is common. Nitrate levels and N/P ratios are low in some mountainous regions, especially in the Pacific Northwest and in desert streams of the southwestern United States where N limitation has been reported (Fisher et al. 1982, Tank and Dodds 2003). In some cases, however, N/P ratios have been found to be poor predictors of nutrient limitation. Although N/P < 10 for periphyton in tributaries of Lake Superior suggested N limitation, Wold and Hershey (1999) found that colimitation by N and P was the most common condition. When Stelzer and Lamberti (2002) manipulated N/P ratios (65:1, 17:1, 4:1) and total nutrient concentration (low and high) in a factorial experiment using once-through streamside flumes, chlorophyll concentration and algal biovolume responded to N addition, but not to changes in N/P ratios. Because the N/P ratio in the source water was high, this outcome was unexpected. 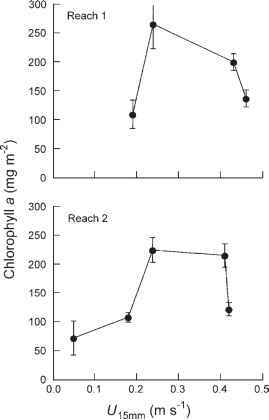 In addition, algal composition exhibited more response to treatments than did overall periphyton abundance, measured as chlorophyll a concentration. Despite very low concentrations of P and N/P ratios between 20 and 36, P limitation was not observed in ten North American streams located over a wide range of latitudes from 18° N (Puerto Rico) to 68° N (Alaska) (Tank and Dodds 2003). Thus, although the concentrations of nutrients and N/P ratios might suggest potential nutrient limitation, it is difficult to generalize about geographical or temporal patterns based only on these values and without confirming experimental evidence. Field studies provide evidence of N, P, and colimitation, and it is difficult to generalize about the frequency of each. When Tank and Dodds (2003) compared algal development on filter papers that capped nutrient-diffusing containers filled with agar and nutrients and placed in ten rivers across the United States, results were variable (Figure 6.8). There was evidence for N limitation alone, N with P as a secondary limiting element, and N and P colimi-tation depending on location. Positive responses were mainly to N enrichment, and in fact no responses to P alone were observed. Although all the streams of Figure 6.8 had relatively low nutrient levels, only half seemed to be primarily nutrient limited; the others probably were limited by other factors such as light or grazing. 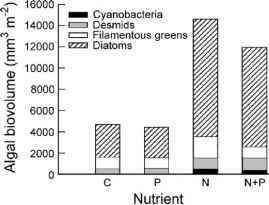 In a review of 158 studies to assess the extent of nutrient limitation of periphyton, Dodds and Welch (2000) found that 13% showed stimulation by N, 18% by P, 44% by both, and 26% did not respond to nutrient additions. A similar but independent analysis by Francoeur (2001) of 237 experiments conducted in the United States, Australia, New Zealand, and India found N limitation in 17%, P limitation in 19%, and colimita-tion in 23% of the cases. A few studies reported inhibition by N or P, and 43% of the studies found neither stimulation nor inhibition of periphyton by either nutrient. Colimitation by N and P may be a common finding because the periphyton includes multiple species that have different nutrient requirements (Tank and Dodds 2003). In addition, in systems where N and P concentrations are low the simultaneous addition of both nutrients may result in rapid uptake of the secondary limiting element and therefore elicit a response to both (Wold and Hershey 1999). As more such studies are completed, we may be able to generalize concerning the geographical and temporal patterns of nutrient limitation. Most studies have been conducted in the temperate zone, particularly in North America, and less is known about other regions, particularly the tropics and high latitude regions (Borchardt 1996). "subsidy-stress" response owing to both beneficial and detrimental effects of flow (Biggs et al. 1998). The flow of water brings continual renewal of gases and nutrients, and so current benefits algal growth by enhancing nutrient uptake. However, current also exerts a shear stress on benthic algae, which can cause cell sloughing, and high flows disturb and scour the substrate. The growth form and architecture of benthic algal assemblages influences their responses to these two factors. Adherent forms are less vulnerable to sloughing than filamentous forms, and may be especially dependent upon diffusion to supply needed materials. Thus, they would benefit most from increased current velocity. Filamentous forms, on the other hand, are exposed to higher rates of diffusion and are more vulnerable to shear. diatoms have more ability to respond to shear than is commonly thought (Biggs and Hickey 1994). Current velocity can influence the arrival rate of algal cells and therefore the process of colonization. Algal community development proceeds more slowly at high velocities, evidently because algal cells are less able to become established, but higher biomass accumulation occurs under intermediate velocities rather than in low velocities due to the positive effect of current on nutrient uptake (DeNicola and Mclntire 1990, Poff et al. 1990). Small species appear to be most effective at colonizing fast current sites, whereas both large and small species were present at sites with slower current velocities (Stevenson 1996). Diatom immigration rates (Stevenson 1983) and emigration rates (Stevenson and Peterson 1991) have been found to vary with current velocity. The continual renewal of nutrients provided by flowing water, along with turbulence and mixing that favor the diffusion of nutrients, can stimulate algal growth, respiration, and reproduction (Borchardt 1996, Stevenson 1996). Whitford and Schumacher (1964) conducted one of the first studies of such physiological enrichment, showing that rates of 32P uptake and CO2 liberation in Spirogyra and Oedogo-nium increased with current up to 40 cm s_1, the highest velocity tested. When algae colonized laboratory streams that were similar except for current velocities (9 versus 38 cm s_1) and received the same propagules from common source water, different assemblages developed (Mclntire 1968). At the higher current, initial colonization was slower but biomass eventually exceeded that of the slower channel, chlorophyll a content was higher, and more biomass was exported. Filamentous chlorophytes and chrysophytes became abundant in the slow stream, whereas diatoms, especially Synedra, dominated under faster current. 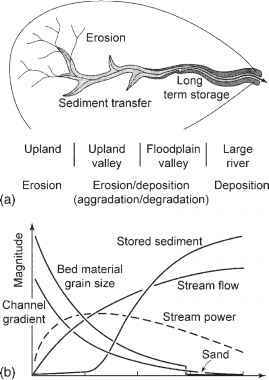 Stevenson (1990) attributed stimulation of diatom growth following a 24 h storm in a gravel bed stream to an increased nutrient supply, caused either by greater flow through mats or increased delivery of nutrients from the catchment. Current velocity may also influence the stable isotopic signature of algae (Trudeau and Rasmus-sen 2003). In diatom assemblages growing on glass and filamentous algae growing on rocks, the fractionation of N and C stable isotopes was greater as water velocity increased, probably because of the effects of current on boundary layer thickness and the diffusion of nutrients. Extreme discharge can have a strongly negative impact on lotic algal populations. Scouring of cells from surfaces can result simply from increases in current velocity, from overturning substrates (Robinson and Rushforth 1987), and from abrasion due to tumbling (Power and Stewart 1987) and perhaps by suspended sediments as well. In streams on the west coast of Vancouver Island, winters are very rainy and limit the growing season to the period between the last spring flood and the first autumn flood. Periphy-ton accumulation demonstrated a clear inverse relationship with a flow index that gave greater weight to more recent as well as more severe events (Shortreed and Stockner 1983). Tett et al. (1978) reached similar conclusions from their study of the Mechums River in Virginia. During a study that extended from 15 May until the following 31 January there were 11 flood-free periods of 7 days or longer, the median duration of low stable flows was 12 days, and the longest was 33 days. The mean density of chlorophyll a increased during low flows and decreased abruptly following floods, indicating that chance rainfall events were the main factor controlling algal populations. The effects of extreme high discharges on ben-thic algae depend on growth form, the senescence of the mat, and substrate. Thus "dense and coherent'' communities such as mucilaginous diatom-cyanobacterial mats tend to increase their biomass as current increases within the interflood period, while stalked-short fla-mentous diatom communities show a unimodal relationship with current, and communities dominated by long filamentous green algae exhibit a negative response to increases in current (Biggs et al. 1998). 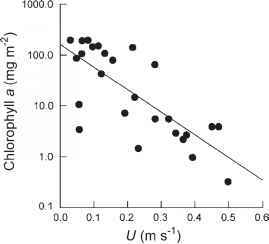 Benthic algae can also influence water velocity depending on its growth form. Dodds and Biggs (2002) found that dense diatom assemblages attenuate water velocity more than do filamentous green algae or red algae. Experiments and field surveys of periphyton communities in New Zealand provide reasonable support for the above generalizations. The biomass of one mucilaginous diatom-cyanobac-terial assemblage increased with increasing current velocity as expected, presumably because of greater nutrient availability at higher velocities (Figure 6.9). However, a second assemblage did not, possibly because it was less nutrient limited. The response for the stalked-short diatom community was unimodal (Figure 6.10), as expected, suggesting that the mat received a nutrient subsidy as velocities increased, until higher velocities resulted in a decrease in biomass. Evidently the stalked-short diatom community experiences greater drag and cell dislodgment than the mucilaginous mat. The filamentous green algae community showed a steady decrease in biomass as current velocity increased, also as expected (Figure 6.11), due to the greater drag experienced by this growth form even at moderate velocities. Creek, Arizona, a substantial periphyton mat was observed to increase steadily in biomass and chlorophyll a for ~60 days following a flood event, until a second flash flood virtually eliminated periphyton and the process recommenced (Fisher et al. 1982). richness did not correlate with time post disturbance in streams that experienced frequent, bed-moving flood events, whereas a positive relationship was observed in streams where such floods were less frequent. Biggs and Smith (2002) proposed that initial recovery of benthic algae proceeds rapidly (within 1 week) and involves taxa with high tolerance to disturbance as well as taxa with high reproduction and immigration rates. Subsequently, taxa appear that are less resistant to flood disturbance and have lower rates of immigration and growth. The duration of this second phase (one to several months) is more variable among streams because it is more susceptible to resource supply, which likely varies among streams. Substrate, either living or nonliving, provides a surface for benthic algal growth where physical and chemical conditions differ from the surrounding water (Burkholder 1996). The physical structure and the stability of the substrate may influence algal colonization. Algae that grow into large mats are usually found on larger stones, while small, motile algae colonize sediments and small particles (Burkholder 1996). In streams of Eastern Ontario and Western Quebec, Canada, finer substrates were dominated by motile diatoms and cyanobacteria, whereas prostrate and filamentous algae occurred on larger substrata (Cattaneo et al. 1997). Microbial conditioning of substrates can influence algae colonization, resulting in higher algal colonization when biofilm development or bacterial abundance is greater (Hodoki 2005). Peterson and Stevenson (1989) found that diatom colonization was enhanced by conditioning of the substrata with a nonalgal biofilm, although the result was observed only in fast currents, and reversed in slow currents. Steinman and Parker (1990) suggest that substrate conditioning has a short-term influence on benthic algal growth and probably is more important in streams with high frequency of disturbances. 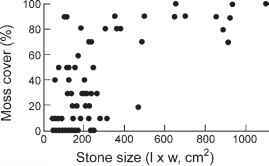 Nutrients and other aspects of the chemical environment may vary with substrate conditions, particularly for epipelic and epiphytic populations, but perhaps also for epilithic taxa on occasion, depending on the chemical characteristics of the stone (Burkholder 1996). By influencing algal growth rates, temperature affects the biomass and production of benthic algae, and because species may differ in their responses, temperature also can alter assemblage composition. Major divisions of algae show a trend to dominate in different temperature ranges: diatoms between 5°C and 20°C, green and yellow-brown algae between 15 °C and 30°C, and cyanobacteria above 30°C, although this is by no means a universal pattern (DeNicola 1996). Seasonal changes in the taxo-nomic composition of benthic algal assemblages are observed in temperate rivers, and warmer temperatures probably are partly responsible for the greater representation of green algae and cyanobacteria during summer months. By assembling data on primary productivity for stream periphyton as well as lake and ocean phytoplankton, Morin et al. (1999) developed empirical models to predict primary production from chlorophyll a and water temperature. Although production was lower in stream pe-riphyton than in lake or marine phytoplankton, presumably because of reduced nutrient diffusion into algal mats, production was more strongly related to water temperature in stream periphyton than for phytoplankton of either lakes or oceans. Numerous studies provide strong evidence of the important influence of grazers on benthic algae in fluvial ecosystems (Feminella and Hawkins 1995). Grazers can reduce algal biomass and influence community composition by selectively eliminating certain species and growth forms (Steinman 1996, Rosemond et al. 2000), and also can affect nutrient content and diversity (Poff and Ward 1995, Hillebrand et al. 2004). Regulation of algal biomass by grazing invertebrates and fishes has been reported in a number of instances, often with evidence of an interaction between the effects of grazers and nutrients (Hillebrand 2002). From a literature survey of 85 experiments that examined herbivore presence and nutrient supply, Hillebrand (2002) found that both had strong influence, and grazer effects were greater than nutrient effects. Manipulation of nutrients and grazing snails (Elimia clavaeformis) in Walker Branch, Tennessee, showed that algal species most reduced by herbivores were those that increased most in response to nutrient addition, and vice versa, suggesting a trade-off between resistance to herbivory and nutrient-saturated growth rates (Rosemond et al. 1993). Grazed communities were dominated by chlorophytes and cyanobac-teria, which were overgrown by diatoms when herbivores were removed. Flecker et al. (2002) observed strong effects of both N addition and herbivorous fishes on algal standing crop in a tropical river, but consumer limitation was found to be considerably stronger than resource limitation in influencing algal biomass and composition. Hydrologic variability is an important mediator of grazer-algal-nutrient interactions. Algal biomass is more responsive to nutrients in frequently scoured streams, whereas in more stable streams grazers can suppress algae regardless of nutrient concentration (Riseng et al. 2004). This growing body of experimental evidence that argues convincingly for strong interactions between herbivores and algal communities in lotic ecosystems will be described in greater detail in Chapter 9.